They joined forces in 2016 to create a show with NY Times bestselling author Jane Yolen based on her otherworldly poetry. Now Max Cohen, Lui Collins and Donna Hébert perform as 3 ravens. 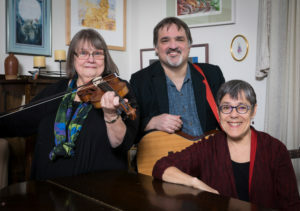 The trio crafts an evening out of their originals, instrumentals and traditional songs, as well as Jane’s verses set to music. Harmonies blend three strong voices, paring down to just one when the story shifts shape. Donna’s fiddling morphs from light to dark, while Lui’s piano, banjo and ukulele converse fluently with Max’s guitar. 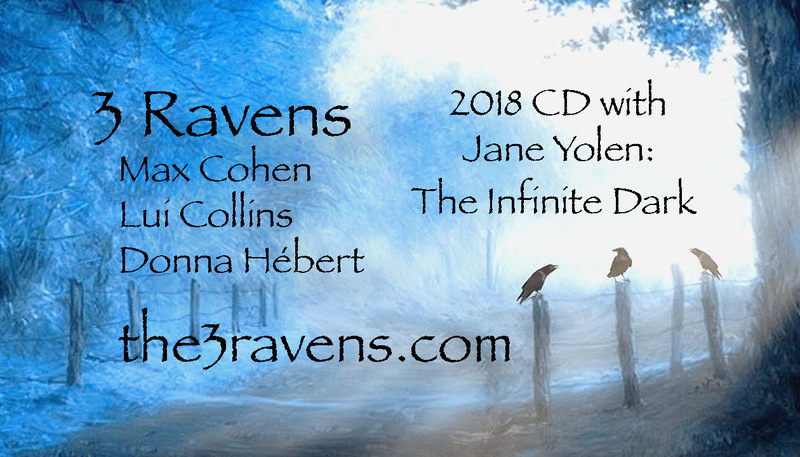 3 ravens offers a rich and joyful audience experience . . . and if the fiddle catches your feet, you might just find yourself dancing! Donna Hébert has been cited for “outstanding artistic achievement” by Massachusetts Governor Deval Patrick. Dr. Alan Jabbour, Dir. (ret)., American Folklife Center, Library of Congress, calls her “An outstanding performer and world class teacher. I consider her at the forefront of the developing field of fiddle pedagogy.” Donna’s Fiddling Demystified for Strings is a “cornucopia of fiddling” (Darol Anger, Berklee professor) and “should be required reading for all string teachers.” (Strings Magazine).